Be your own Easter Bunny. Enjoy free Easter chocolate from Tesco up to the value of £1.00. Products include the Cadbury Mini Daim Eggs Bag, Galaxy Chocolate Caramel Mini Egg Bag, Kinder Milk Chocolate, Hazelnut Mini Eggs, and many more. 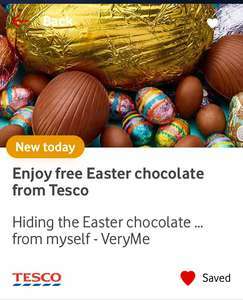 Get free Easter chocolate up to the value of £1.00 from Tesco. Offer includes only specific products – check the T&Cs. You’ll need to scan your code at the self-serve checkout in-store with your chocolate. Code Expiry Date: The giveaway will open at 00:01 on the 16th April 2019 and close at 23:59 on the 21st April 2019 or 1 hour after it has been claimed within the app, whichever is sooner.Offer Detail: The giveaway is free ‘Easter chocolate” up to the value of £1.00. Products include Cadbury Mini Daim Eggs Bag (86g), Cadbury Dairy Milk Egg Heads Easter Egg (77g), Galaxy Chocolate Caramel Mini Egg Bag (80g), Kinder Milk Chocolate and Hazelnut Mini Eggs (75g), Nestle Milkybar Chicken in An Egg (100g), Cadbury Dairy Milk Chocolate Easter Popping Candy Bunny (50g), Cadbury Crème Mini Eggs (89g), Smarties Mini Eggs Pouch (90g), Cadbury Mini Eggs Bag (80g), M&M’s Chocolate Eggs Sharing Bag (80g), Milkybar Small Easter Egg (65g), Malteser Mini Bunnies Milk Chocolate Pouch (85g), Cadbury Dairy Milk with Oreo Minis Bag (82g), Cadbury Dairy Milk Small Easter Egg (72g). To benefit from the giveaway, you must scan your unique barcode at the self-serve checkout in-store along with your Easter chocolate. There are 30,000 Easter chocolates up to the value of £1.00 to give away. The first 30,000 people to claim a code in the VeryMe app will be able to claim this giveaway. Using this method, one entry can be submitted per person. Digital e-gift cards are accepted in all Tesco stores with the exception of Tesco petrol stations and Jacks. Products are subject to availability and may not be sold in some Tesco stores. E-gift cards cannot be exchanged for cash or credit. Damaged, altered or cancelled e-gift cards will not be accepted. Enjoy free Easter chocolate from Tesco up to the value of £1.00 - 'Every little counts'! Anyone know if this is just a general £1 off anything voucher or has it got to be chocolate? but t&c 3 - Exclusions: The Tesco e-gift card is only valid against any Easter chocolate up to the value of £1.00. This seems to work on anything in store as I’ve just bought a weetabix breakfast drink with it! This seems to work on anything in store as I’ve just bought a weetabix b …This seems to work on anything in store as I’ve just bought a weetabix breakfast drink with it! Does it only work with self service? £1 on chocolate really!?! Vodafone could have at least run a few months of good deals before turning into Wuntu! £1 on chocolate really!?! Vodafone could have at least run a few months of …£1 on chocolate really!?! Vodafone could have at least run a few months of good deals before turning into Wuntu! I bought a sim with £10, activated yesterday and still cant see veryme rewards. Do i need to spend credit, actually topup £10 or just wait longer? I bought a sim with £10, activated yesterday and still cant see veryme …I bought a sim with £10, activated yesterday and still cant see veryme rewards. Do i need to spend credit, actually topup £10 or just wait longer? The button should appear in the myVodafone app, but when you press it, there will be a message saying something like 'Sorry, we are having trouble getting you through to VeryMe Rewards'. You can't do anything, it is meant to work after 4 days of activation but it probably won't. I bought 6 SIMs over the last few months, only 4 worked with VeryMe. The button should appear in the myVodafone app, but when you press it, …The button should appear in the myVodafone app, but when you press it, there will be a message saying something like 'Sorry, we are having trouble getting you through to VeryMe Rewards'. You can't do anything, it is meant to work after 4 days of activation but it probably won't. I bought 6 SIMs over the last few months, only 4 worked with VeryMe. Thanks, for the ones that worked how long did it take? It is meant to take 4 days. For the first one, it took over a month but it is still working until now with no top-up (no idea how). For the others, it depended. Mostly 4 days to a week. I agree they have got worse but it's a freebie after all. I'll take the £1 Tesco voucher if you don't want it. Anyone used over the hour? I have previously but wasn't sure if this one works the same. Anyone used over the hour? I have previously but wasn't sure if this one …Anyone used over the hour? I have previously but wasn't sure if this one works the same. That's what I intend to do anyway! I did this  got the maltesers one. I already uploaded my receipt, got the Oreo one (well, I know someone who works at Tesco who bought me one anyway, 10% off). Hopefully the receipt works still, but should do as price of egg is still £1.50! Anyone got some spare codes? Can trade next week O2 Caffé Nero for the VeryMe Tesco code. You bought them? I got them for free without putting a penny into them. VeryMe still worked after 4 days. You bought them? I got them for free without putting a penny into them. …You bought them? I got them for free without putting a penny into them. VeryMe still worked after 4 days. What do you mean? You ordered a free Vodafone SIM and it worked? Why not just £1 off. Who's going to Tesco and spending less than £1? Wow for once voxi got something better.